Rosie Orgles finds luxury and adventure on the world's third largest island. Spreading across the northern part of Malaysian Borneo, Sabah offers many holidays in one. From the bustling capital of Kota Kinabalu, with shopping malls and city attractions aplenty, to breathtaking beaches and some of the globe's oldest rainforests – a trip here promises one like never before. Whether you're after a relaxing holiday with your new hubby or an adventure-moon, the year-round summer weather and warm sea means you have the choice of all 12 months to enjoy its natural beauty – with some slightly wetter than others. We couldn't have received a friendlier welcome on arrival; after disembarking our two-and-a-half hour flight from Kuala Lumpur, my partner and I were greeted by Shangri-La staff at the arrivals gate and whisked off to the Rasa Ria Resort & Spa in the Tuaran District. A short half-hour drive through the city and out past local villages gave us time to absorb the diversity of this destination and led us to our high-end hideaway. Cheerful staff welcomed us with refreshing drinks, cold towels and a traditional musical performance; it was at this moment that we first recognised the passion in which the staff have for Sabah – more than 90 per cent of the staff are from the local area and they continued to ooze pride and showcase the area's charming characteristics for the duration of our stay. 'Rasa Ria' means 'a feeling of absolute joy and happiness, and total ease with oneself and one's surroundings' and the Shangri-La resort certainly delivers. A luxury beachside property located along Dalit Beach, it boasts its own 64-acre Nature Reserve nestled within 400 acres of tropical jungle. Our room, situated in the exclusive Ocean Wing, provided views of the 3km white sand beach from its large sea-facing balcony – big enough to house an outside bath for two. The room was complete with a spread of fresh fruit, chocolates, a fridge full of complimentary chilled drinks and a pillow menu, no less. Rasa Ria is made up of 499 rooms and suites across its Garden and Ocean Wings that offer their own pools and share a gym, internet cafe, medical clinic and shop. In addition, the Ocean Wing has an outside Jacuzzi and Italian restaurant, Oceano, which is exclusively for its residents at breakfast time. The décor throughout is earthy and natural, inspired by the ethnic richness of Sabah. By day, like us, you can while away hours sunbathing by the pool or on a beach cabana, seek a thrill from the many different watersports available, from sailing and paddle boarding to jet skiing, or head to the spa to indulge in some R&R. The traditional couple's massage is a must; 60 minutes of relaxation that starts with a cup of green tea and a foot soak followed by a rejuvenating treatment alongside your beau – it's a much-needed retreat from the sun. Though fly-and-flop holidays are appealing to most who are in need of some time out from their hectic home life (or wedding planning! ), we challenge you to do nothing but stay poolside at Rasa Ria. With rainforest on the resort's doorstep, the Nature Reserve beckons you to venture inside and discover its offerings – and trust us, you won't be able to resist. Home to mammals such as long-tailed macaques, sambar deer, pangolins, porcupines, slow loris, bear cats (binturong) and the famous huge-eyed western tarsiers, as well as more than 60 species of birds, 30 species of butterflies, insects and reptiles, there's a whole other world to be explored – which we did with much amazement. Adventure-seeking couples can trek further afield, but still nearby, to places such as Sandakan and Danum Valley – depending on the level of 'adventure' you wish to seek. After experiencing this incredible place, you can't help but let it steal a piece of your heart and you instantly feel the need to sustain it. A feeling shared with the resort as it's environmentally-concerned and ensures it conserves its surroundings; actively cutting down or preventing chemical pollution, reducing waste, water and energy usage, and preserving its natural flora and fauna by working with the Sabah Wildlife Department. Come dusk, the beauty of Borneo intensifies thanks to its stunning sunsets. 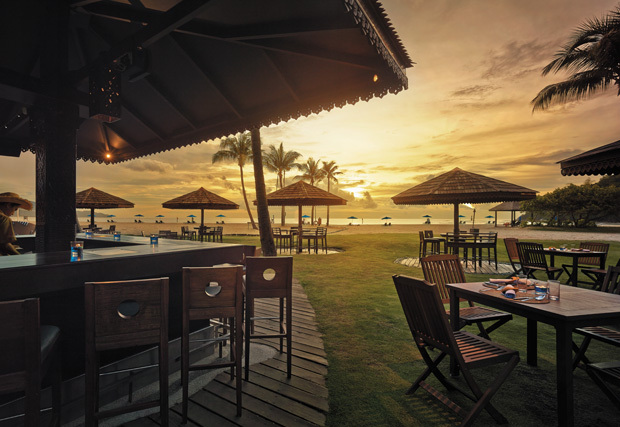 This can be enjoyed all over the resort, but one place you should be sure to watch the sun go down is the beachside Sampan Bar. The gorgeous yellow, amber, pink and blue colours of the sky provide the perfect backdrop to the atmospheric live music while you sip on fresh cocktails, gazing out to sea. When it comes to dining, you're spoilt for choice – with more than 10 different spots to enjoy food, drink or a sweet treat, you can tuck into the finest international cuisine. Don't leave before tasting the delicious Italian food at Oceano, be sure to book a table at Kozan Teppan-yaki and have your Japanese meal cooked before your own eyes, and be entertained by the cultural show at Tepi Laut, a vibrant restaurant offering street food-style fare. Not forgetting its highly-recommended, award-winning Indian restaurant, Naan. Our trip concluded on an absolute high – not that we had come down from cloud nine all week – with a private dinner in a beachfront gazebo. Champagne, the sunset, delicious food and nothing but the sounds of rippling waves at the shoreline – can a setting get any more romantic? We had truly fallen in love with Sabah and as the staff sung us a farewell song we knew we were leaving a special place, one that we instantly felt a desire to return and see more of what this incredible island has to offer. 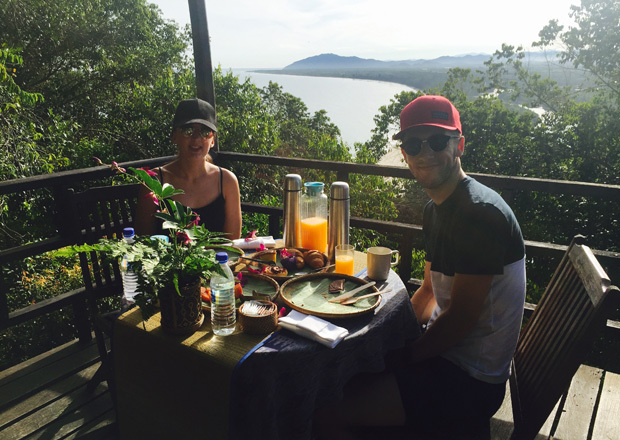 Rosie's Borneo honeymoon must dos! We set sail on a private boat that took us down the river, in and out of coastal mangroves, to floating villages, past water buffalo, and to prawn and oyster fishing spots. We had the most amazing views of Sabah's iconic Mount Kinabalu in UNESCO World Heritage Site Kinabalu Park, and watched the sun set on the South China Sea. We urge you to do the same! An early start but totally worth it! Setting off from the Nature Reserve at sunrise, a guide led us through the tree tops, taking us over suspension bridges, recognising the different calls of insects and animals, and pointing out any creatures we passed – including a viper snake – as we climbed to the highest point for a delicious, colourful breakfast of fresh fruit and pastries with flasks of tea, coffee and juice. With far-reaching views out to sea and inland from the high platform 90m above sea level, there were photo opportunities aplenty. Braving the darkness and venturing into the depths of the resort's Nature Reserve with nothing but a torch and a pair of infra-red night-vision goggles isn't for everyone – and I was apprehensive to say the least – but it's a must! When else will you go on such an adrenaline-fuelled nature tour? Our experienced guide was tuned in to every sound and smell in the hope to spot creatures as they came out at night, which in our case were tarantulas, scorpions and frogs to name but a few. 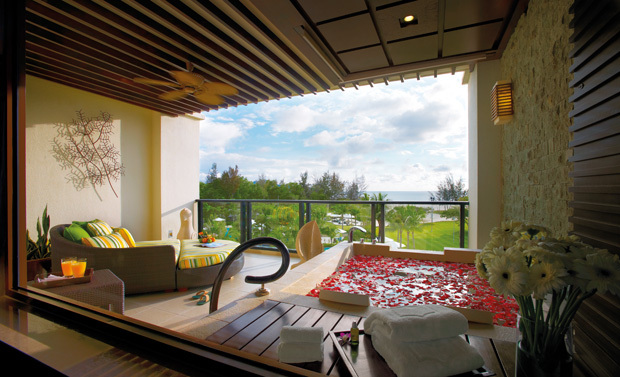 Enjoy a rose petal bath on your balcony – kick back with your loved one and absorb the views from your private tub, and why not opt for in-room dining to follow? You can use the bath at your leisure throughout your stay but for that extra special moment, all Ocean Wing residents can enjoy a bath complete with bubble bath, salts or rose petals prepared for them by the resort staff – bliss! Tell people you're travelling to Borneo and their response is certain to mention orangutans. Though the resort once had these gentle red apes in their Nature Reserve, the best place to see them now is the Sepilok Orangutan Rehabilitation Centre, Sandakan. A day trip worth making! You don't have to be a golfer to appreciate just how impressive the resort's 18-hole championship golf course is. 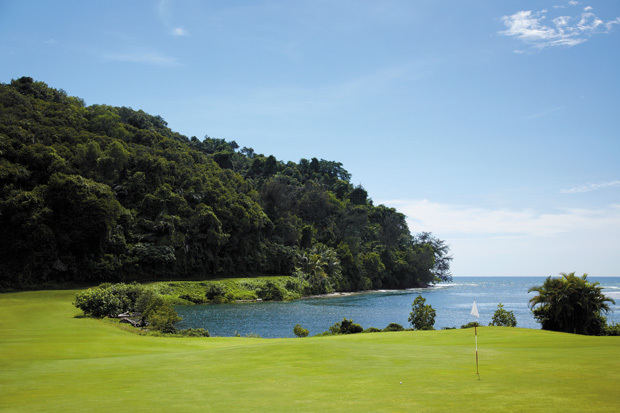 Practice your technique at the aqua driving range or work your way around the lush green course taking in the views of the South China Sea and Mount Kinabalu – and if you're lucky you'll be joined by a roaming monitor lizard or catch sight of its resident otters. Whether you opt for a twin-centre honeymoon or wish to head straight to Borneo from the UK, there are plenty of options. Direct flights to Kota Kinabalu International Airport are available from Kuala Lumpur, Tokyo, Hong Kong, Seoul, Singapore, Manila and many other airports. 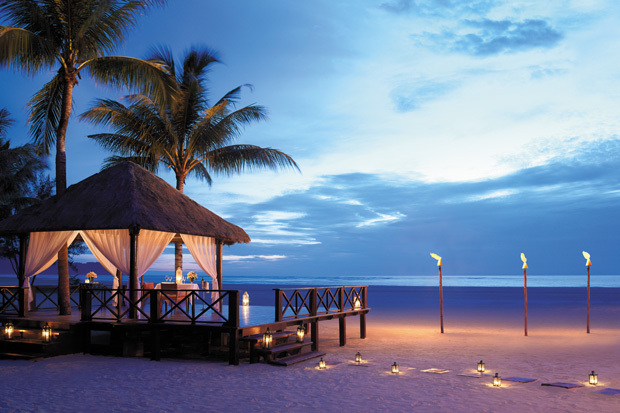 The resort’s Romantic Escapes to Borneo package is ideal for honeymooners. Offering excellent value, it includes accommodation, breakfast, return airport transfers, complimentary minibar, horseback riding, the ‘Breakfast With a View’ experience, plus predinner drinks and much more. Terms and conditions apply. 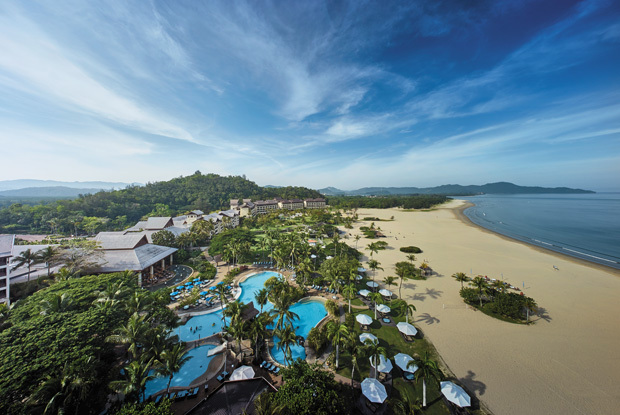 Visit the ‘Offers’ page at www.shangri-la.com/kotakinabalu/rasariaresort for details. Exclusive to readers of County Wedding Magazines, Rasa Ria Resort & Spa is offering a complimentary Night Vision Goggle Trek for two people when you book the above package. Simply quote ‘COWEDD’ on booking.